Stuart W. Henn, Museum Education Coordinator examine several Data related TED Talks and other recorded presentations. Data: BIG/-driven/Visualized… is a multidimensional exhibition that delves into the array of manner in which data surrounds us, impacts us and is interpreted. From the enormous amount of bytes of information constantly being produced, collected and analyzed; to the notion that decisions are made objectively when based on data; to the nuanced means of making numerical information comprehensible and compelling through graphic and physical representation, BIG/-driven/Visualized… explores the data in our lives. The exhibition has a range of artists engaged with data visualization. At one end of the spectrum are artists like Northern Illinois University School of Art and Design faculty Joe Insley who is seeking visual analysis of data in pursuit of a deeper understanding of the data itself. At the other end of the spectrum are artists like Rhode Island School of Design faculty Sam Yates who is exploring the potential for metaphoric associations through his examination of the unexpected patterning that data analysis provides. Museum staff members, Exhibition Advisory Committee and guest co-curator Richard Siegesmund, Professor of Art+Design Education in the NIU School of Art and Design, assembled a range of artists engaged with data visualization in the BIG/-driven/Visualized… exhibition. Siegesmund has an interest in both quantitative and qualitative research, and the design of data reports that promote thoughtful public reflection and discussion. Exhibiting artists include: Christopher Baker, School of the Art Institute of Chicago (SAIC); Michael Banicki, Chicago (NIU alumnus); Courtney Barr, Louisiana State University; Stephen Cartwright, University of Illinois Urbana Champaign; Annie Laurie Erickson, Tulane University; Chad Erpelding, Boise State University; Andrew Hunter, SAIC; Joseph Insley, School of Art and Design, Northern Illinois University; Anne Lindberg, University of North Carolina, Wilmington; Nathalie Miebach, Massachusetts College of Art; Andrew O’Brien, University of Tennessee, Chattanooga; Michael Oliveri, University of Georgia; Kim Rice, Baltimore; Jason Salavon, University of Chicago; Frances Whitehead, SAIC, (NIU alumna); Kalina Winska, Valdosta State, GA; Yamin Xu, Northern Illinois University, (NIU Graduate student); Samuel Yates, Rhode Island School of Design. This exhibition is sponsored in part by Northern Public Radio WNIJ/WNIU. 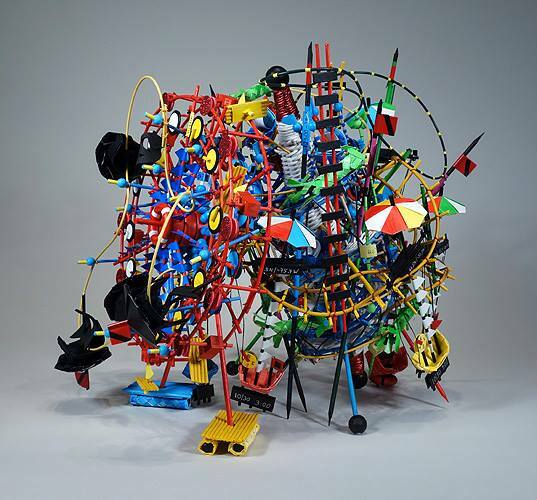 Image: Nathalie Miebach. Chutes and Ladders, 2015 (14x18x20).